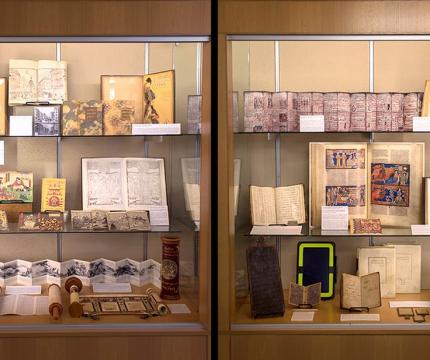 Western Libraries Heritage Resources at Western Washington University hosts a new exhibition entitled “The Global Book,” which invites viewers to consider books as one point of departure for exploring our shared global heritage. 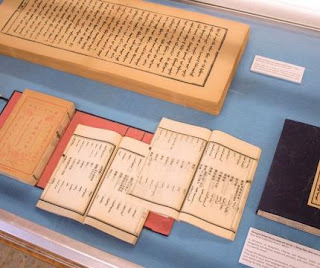 How do books’ physical attributes reveal cross-cultural influences? Have the same creative impulses emerged in places hundreds of years and thousands of miles apart? Can juxtaposing one book with another tell us something about each that we cannot get by looking at just one? These are some of the questions that the exhibition raises. Among the materials on display are examples of manuscript illumination from medieval Europe and the Middle East; a selection of illustrated bindings produced in Japan, Europe, and the United States; a Quranic writing board; a Roman wax tablet; two Buddhist sutras; an original palm leaf manuscript; and several highlights from Western Libraries’ prominent Mongolian Studies collection. For more information about the exhibition, please contact Michael Taylor, Special Collections Librarian, Michael.Taylor@wwu.edu, (360) 650-3097.